Philips' Clear Print Popular Plan on London. 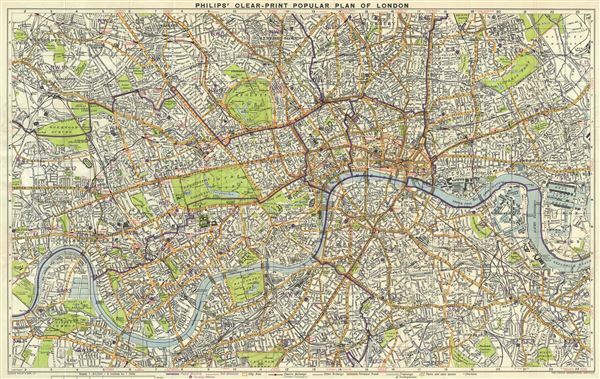 This is a beautiful c.1930 map or plan of London, England by George Philip and Sons. It covers from Acton Park east to West India Docks and from Hackney Downs south as far as Clapham Common. The map is exceptionally detailed, noting individual streets, parks, railways, churches, roads and tramways. A legend is included in the bottom margin. The map is accompanied by a 36 page booklet consisting of a street index. This map was created by George Philips and Sons Ltd. and issued by the London Geographical Institute. Very good. Some wear along original fold lines, including rips and tears along folds. Attached to original binder and accompanied by 36 page street index.